But then details begin to come into focus, such as what appears to be advertising banners by The North Face and what could likely be two timekeeping clocks. 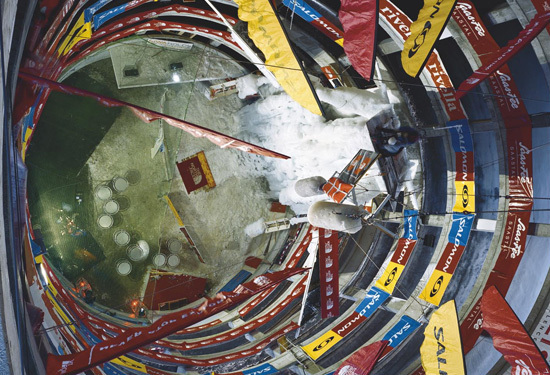 Since the series as a whole documents the artificial landscape of Alpine sports and leisure, it's safe to assume that this is a venue for indoor ice-climbing races. Spiraling around this atrium, then, would be viewing balconies. Spinatsch doesn't offer much information. We know the building is in Austria, France, Italy or Switzerland, but exactly where is a mystery. The building itself is difficult to ascertain. What kind is it? Is it a freestanding concrete silo constructed solely for this single outdoor-indoor sport? Is it a multi-story parking garage with a secondary function? Is it a defunct mall, an early victim of the credit crunch, now repurposed? Of these possibilities, it is the last that we find the most compelling. Imagine that the collapse of the global financial sector and the resulting dramatic fall in consumer spending have caused scores of retail chain stores to declare bankruptcy. Malls everywhere are shuttered. Imagine further that, as but one adaptive re-use, these abandoned cathedrals of capitalism are turned into ice-climbing clubhouses. Where people had once gorged thousands of calories in one serving, now people are burning those same calories belaying an icefall in the Food Court. Where once the multi-carded and the debt-ridden had found comfort in materialism, they now come to experience a similar adrenalin rush from the prospect of multiple compound fracture, if not death. Where once they had hopped from store to store in a zombie-like delirium, there, in a kind of Waldian introspection midway up a simulated glacier (Thoreau's frozen New England pond reconfigured vertically, if you will), now they are considering a fundamental alteration to their lifestyles, a change for the better. Of course, he was talking about his own architectural spaces, but maybe it could be similarly prescribed to these repurposed architectures of our own economic demise. And for anything newly built. Good catch! Not knowing that Saastal was in Switzerland and finding that the font used in the ad banner has at least a passing resemblance to the one used by Sara Lee, I really thought that Saas-Fee was an Austrian/French/Italian/Swiss food company, which manufactures, among other things, high energy bars. 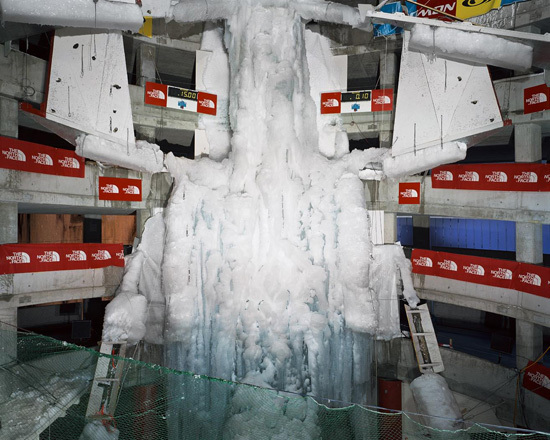 Having followed the link it appears as if the structure is actually used/constructed exclusively for the purpose of indoor ice-climbing competitions? After a while, I stopped figuring out what it is, and just started to think that it's a future Thunderdome in a glacial apocalypse where polar gladiators battle each other with ice axes and anchor screw metal knuckles. And somewhere in the upper levels, Tina Turner is shouting out, "Go Master Blaster!"